OTTAWA — Canada is poised to contribute tens of millions of dollars toward further development of the F-35 stealth fighter even as the federal government wrestles with whether to buy the plane or not. In an interview with The Canadian Press, the Department of National Defence's head of military procurement says there are no plans for Canada to quit as one of nine partner countries in the F-35 stealth fighter program until after the Trudeau government completes the competition to determine which fighter jet will replace Canada's aging fleet of CF-18s. "We're committed to staying there (in the program) until we understand where the competition will bring us," said Patrick Finn, assistant deputy minister of material at National Defence. The competition is expected to be launched this spring. The F-35 is one of four planes currently slated to participate in the $19-billion competition, which will result in the purchase of 88 new fighter aircraft to serve as the air force's backbone for the coming decades. The Trudeau Liberals campaigned on a promise not to buy the F-35s in 2015, but have since backed away from that pledge. The Harper Conservatives first announced plans to buy 65 F-35s in 2010, but ran into controversy over cost. Staying on as a partner in the F-35 program comes with advantages, Finn says, including the ability for Canadian companies to compete for billions of dollars in contracts associated with building and maintaining the stealth fighter. Partners are also allowed to buy the F-35 at a lower price than non-partners, who must pay a variety of fees and other costs to purchase the plane. "We want to keep the F-35 as an option, as a contender in the competition," Finn said. "We want to also make sure that while that's unfolding, that Canadian industry that have competitively won contracts get to continue to do that." The Defence Department says Canadian companies have won more than $1.25 billion in F-35-related contracts over the years. Yet there are also costs to being a partner; Canada has so far invested more than $500 million into the program over the past 20 years, including $54 million last year. Its next annual payment is due this spring and there will likely be more as the competition isn't scheduled to select a winner until 2021 or 2022. The first new aircraft is expected in 2025 and the last in 2031. There are some technical issues that government officials are working through that could impact how it runs the competition to replace the CF-18s. One of those is how to ensure the various bids are all measured equally. In addition to Lockheed Martin's F-35, bids are expected from Boeing's Super Hornet, Eurofighter's Typhoon and Saab's Gripen. All four companies recently provided feedback on a draft process that the government has drawn up to run the competition, and another round of consultations is scheduled for mid-February. A big question facing Lockheed is how it can meet Ottawa's usual requirement that companies who are awarded large military contracts invest back into Canada on a dollar-for-dollar basis. 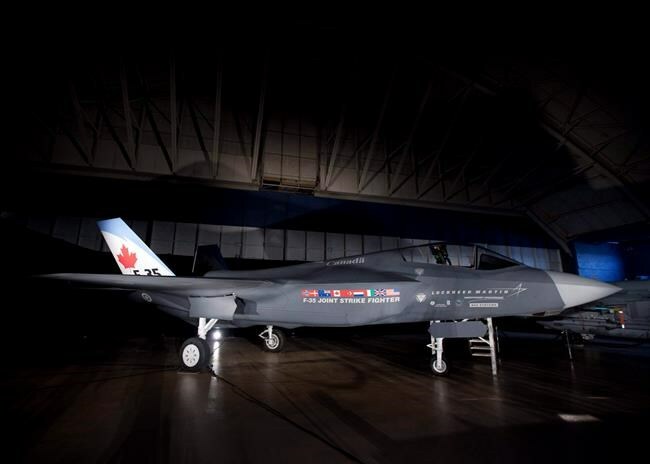 The F-35 partnership agreement that Canada signed with the other countries bars such promised investments and instead stipulates that companies must compete for the work. Finn said all four jet companies have unique challenges and circumstances, and that officials in charge of the competition could inject some flexibility into how the requirement is handled. "There is absolutely flexibility and I would say my colleagues in (the federal industry department) demonstrate that on a weekly, monthly basis," he said. "They would be the first to say, and they're very good at saying, is: 'Well listen, the first intent is to get the right military capability. We want to have the offsets as well, and with a given market segment, what it is that we do and how do we do it.'" © 2019 National Newswatch Inc.